PuzzleMad: The puzzle geniuses do it again! Three Helical burrs - Helical, W(h)orl(e)d and HELLical! 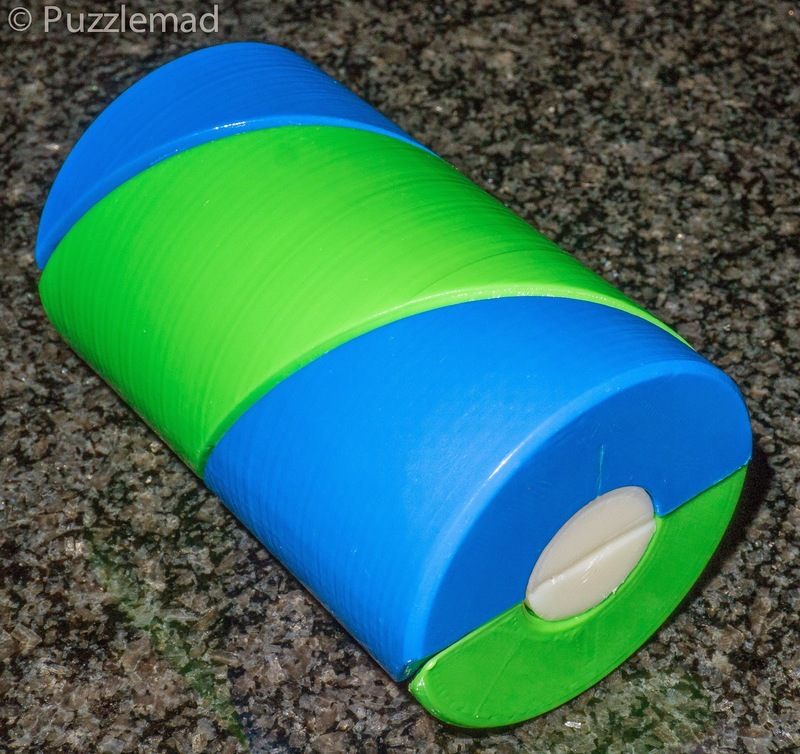 Not long ago I posted a review of the second (tougher version) of a new type of puzzle - that is a 4 piece burr which has been rotated into a double (?quadruple?) helix shape. The original was the Helical burr designed by the amazing Derek Bosch and (my version at least) 3D printed by Shapeways before the terrible "PriceApocalypse" which effectively killed much puzzle design. There have also been a few copies made on his Threedy printer by my good friend Steve Nicholls. I absolutely adored the first Helical burr and was not at all surprised when it won the Jury grand prize at the IPP design competition in 2013. Earlier this year I was chatting to Derek and he told me about his design for a significantly harder version of the Helical burr which he named the HELLical burr and was delighted to be able to get a copy from Steve. This was by first experience of a home 3D printed version and was very pleased to see how fabulously smooth the version was. I gushed about that one here and even went so far as to post videos of the disassembly and assembly to help people who were truly stumped they can be found here and here. The HELLical burr was really was extremely tough and, having practiced it so much for the video, Steve decided that he would use my skills at the last MPP! He forced me to disassemble and assemble a fair number of the ones that he had made to work out which had acceptable tolerances! Since then I think he has made and sold a considerable quantity all over the world. I was aware that Derek had been working on another design with Steve but did not realise how far along they had got until about a month ago I realised that I had missed an announcement on Facebook that the third design, the W(h)orl(e)d Burr, was complete and actually being produced for sale! Unluckily for me the whole lot had sold out within a single evening! I tried not to send a whinging email to Steve that I had missed it because I knew that he was really busy with his new job as well as starting the massive task of printing his exchange puzzle for this years IPP. My friend Jamie did manage to obtain one of the new ones and posted on his FB page that he was finding it quite tough - this didn't surprise me initially. But I was surprised that even after a week or so he had not managed to assemble his copy. I know Jamie is now quite an accomplished puzzler and if he struggled that much then I really needed to try for myself - I was expecting a horrendous task. I was really pleased when after just a few weeks Steve put up another batch for sale on Paradise and I nabbed one straight away. It arrived (with a nice note) a few days later. 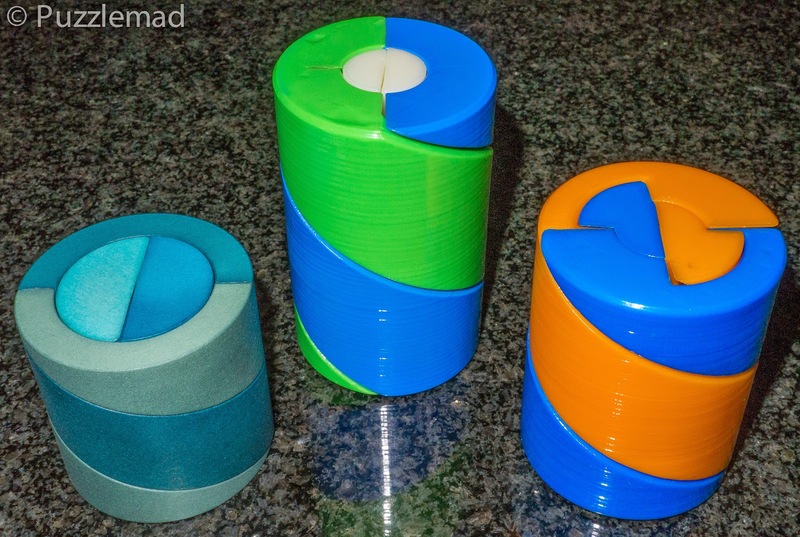 "Happy twisting and here's hoping you are soon on top of the w(h)orl(e)d"
4 rather similar looking plastic helices - how on earth to put these together? I arrived home from work to find a nice package waiting for me and Mrs S was doing the ironing. She gracefully allowed me time to have a little play before it was time to cook the evening meal! The puzzle arrived with the inner helices intertwined and the outer ones too - was this some kind of clue to the correct orientation? Hell no! I remembered how bloody difficult the HELLical burr had been and really worried that starting from the pieces may prove to be an impossible challenge for me. I sat down and had a proper look at the pieces and noticed they are very asymmetrical - this should be very helpful in the solution. They were not so asymmetrical that there could be only one possibility but it narrowed down the orientations to try. Now I am no genius like Derek and cannot look at a puzzle and see the solution! For me there has to be lots of trial and error (with more error than anything else!) but I very quickly made some discoveries that were very useful and surprised myself. Yes I was sitting with an assembled W(h)orl(e)d burr within 15 minutes, I sat looking at it in disbelief! As usual, I actually had no real idea how I had done it so promptly took it apart and tried again from scratch. Yet again, using my basic discoveries, I was able to assemble it quite quickly and then decided it was time to properly investigate the exact set of moves that was required and eliminate any extra unnecessary ones. I know it's not wood but this is a lovely puzzle! The sequence is beautiful - it is nowhere near as complex as the HELLical burr (which I think might be almost impossible for most humans to solve from pieces alone) and is a similar level as the original Helical burr (requiring 16 moves to remove the first piece). I definitely agree with Steve and Derek's decision that it should be sent out disassembled - it is a very achievable challenge and really enjoyable. It was good to see that Jamie managed to assemble his a day or so later! I have kept this in the living room for the last week and it makes a great worry bead as I assemble and disassemble it repeatedly. Why would I do that? Well to give me enough practice to make a video solution of course! I don't do much video blogging because it is so time consuming and I have very few camera and editing skills but what I have produced has met with considerable approval. So I thought I would do it again for you. Remember, this is a spoiler - if you think you might be buying the puzzle in the future then DON'T watch the videos! You have been warned!! The videos are at the bottom of this page. Do you want a copy of any of these puzzles? Steve is quite busy making his exchange puzzle just now but if you ask nicely he might agree to make more of these after he has done with them (a couple of months I should imagine). 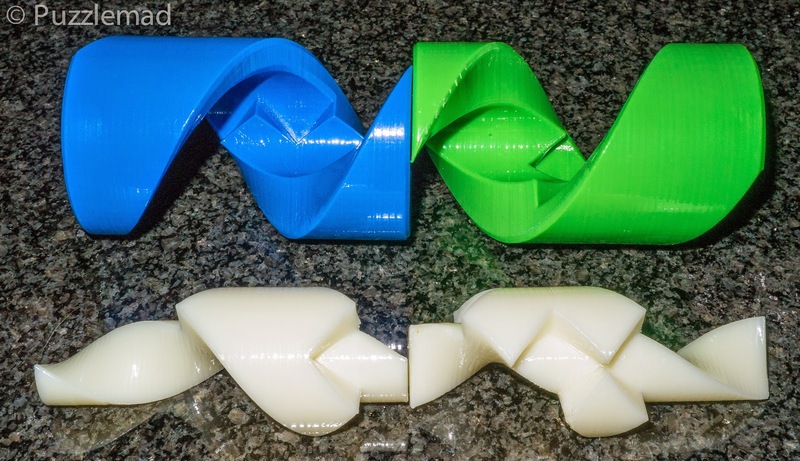 If you really want one now then I would suggest that you bite the price bullet and buy at rather high price (Shapeways' fault) from Derek's Shapeways shop - all three of the puzzles are available in this shop (the W(h)orl(e)d burr is called the helix burr v2). The feel of the Shapeways versions is actually quite lovely - even more smooth sliding than the harder plastic in Steve's homemade version.